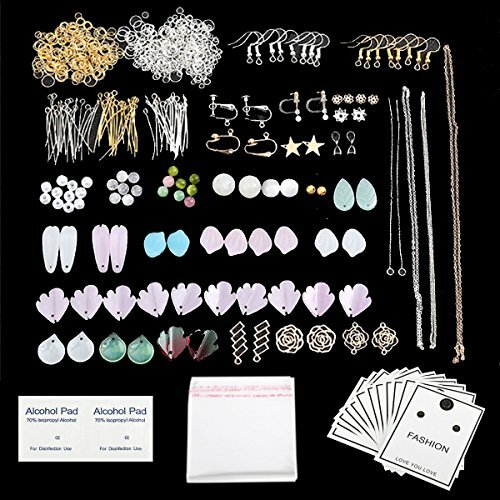 Package Includes - 14 kinds of jewelry making accessories (Details in the product description), 10 Pcs packaging bags, 10 Pcs earrings display cards and 2 Pcs alcohol pads. Earrings Making Accessories - Made of crystal, alloy and plastic. Complete materials, you can play your talent, and design a variety of exquisite jewelry. Applies to most DIY jewelry and clothing accessories, it is also an essential material for making earrings. 10 Pcs Earrings Display Cards - The display card\'s size is 7.5x6cm. After you finsh your earrings, you can display it on the display card and give them to your firend or family as a gift. They suitable for fine or fashion jewellery as they have no writing on. Ideal for both hook and post type earrings. 2 Pcs Disposable Alcohol Pads - Individual package. Can be used to clean your ear piercing and the earrings when you ready to wear it. After-sale Service - If you find any question about jewellery making kit, please contact us immediately. We will provide you a satisfactory answer and one of the quickest solutions.